We had a lot of feedback on Christian’s article on Saturday about the different kinds of diets that are popular right now for people with cholesterol, heart disease / high blood pressure, arthritis, diabetes, and other conditions. Today we have a great recipe that includes some wonderful, fresh ingredients and can be tinkered with to fit all three diets, depending upon your goals and preferences. Sautee the sliced mushroom in the olive oil for a few minutes over medium heat with the taco seasoning. Lightly brown the tortillas in a separate skillet. Layer the mushrooms and cheese (if using) between the tortillas. 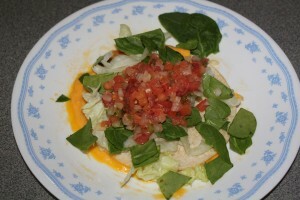 Chop up and toss together the spinach and lettuce and throw it over the tortilla layers. Top with the salsa. This is actually a really filling lunch or dinner meal, and stands quite well on its own. But, if you want a little variety, throw on a side of black beans or some cottage cheese, depending upon what your diet goals are and which one you are following. The filling options can be a great way to use up leftover chicken, pork or beef if you want more protein and aren’t vegan if you aren’t a mushroom person. And, if mushrooms aren’t your thing but you don’t want meat, you can sautee some tofu with the taco seasoning. Or, mash some red beans up and use that with the seasoning as the filler. Beans, tofu, eggplant and mushrooms are a great substitute for meat and they each are loaded with their own bounty of nutrients and healthy chemicals. I use corn tortillas because I don’t want to do wheat anymore due to my IBS, and I kind of like the taste anyway. Plus, flour tortillas get a little drippy and gooey and the corn tortillas hold up a little better if your pico de gallo or garden salsa is watery. If you are going Paleolithic, then the only thing you’d really leave out would be the tortillas and cheese, and then it’s more of a salad. But it’s still a nice way to liven up a restrictive diet without completely blowing your calorie allotment for the day. I eat this dish several times in the week because I love the seasoning and my friend makes out-of-this world salsa. I just experiment with ground turkey, mushrooms, and other possible ingredients to keep it interesting. For those with arthritis, an apple salad (chopped red and yellow apples bathed in lemon juice) and a sprinkle of freshly ground cinnamon is a great way to add antioxidants and a little sweetness to your fiber requirements as well, and it’s a nice compliment to the Portabella Fiesta flavors. For more info on tackling various conditions using diet, exercises and herbal solutions, check out the links on the right hand side of this page. Do you have ideas for substitutions and variations on this inexpensive and really fast meal idea? Leave your comment below and tell us what you love. I was turned off by Julissa vegan diet piece. If you suffer with one of the medical problems she aludes to, and as she touts diets solutions, please understand that the THE RECEIPE ITS SELF WAS FINE. but the search for honest information if you need/look for answers to metabolic cardiology problems (or understanding,I find it a serious search for improving my lifestyle and changing to better health. The existing medical protocols may be in serious error. So far standard medical protocols do not address any connection between nutrition and curing cardiology problems. I’d like to print this nice recepie so as to put it in the kitchen for either daughter to try it. But I don’t want to print all the stuuff on the side or the comments below. It can’t be that difficult for your web master to set up that option. Or is it? I’m not a software designer so don’t know. were are the stats that prove these foods can make a diffrance? Looks like a great alternative. I would like to share my health success. I cured my arthritis, lost weight and I'm full of vigor and energy by just eating potato, fresh carrots and beets every day. Nothing canned or preserved. You can see the results in a matter of weeks. This recipe is a sustained fast diet alternative which allows the body to clean itself entirely. I don't like to call it a diet, its a life style. Buena apetit! I have had to make even more changes in my eating plan than I expected. I have gone to drastic ways to add raw and more healthy vegetables to my diet, especially different types of mushrooms. I cannot eat beef, due to an arthritic reaction to it; so I use many recipes for meat substitutes; then my doctor told me I did need to eat more animal proteins too; as I had substituted many of the meat meals I would have eaten. Now, I am working even harder to balance good proteins, like legumes, fish, chicken, with healthier carbs, and leafy green vegetables. Many recipes have helped me to like this new way of eating; and I can still eat all of the vegetable dishes I liked the best. This recipe sounds like a winner. I already use portabella mushrooms, as a vegetable, and also as a meat substitute; and I like them. I have also noticed the writings of Christian Goodman, as very knowledgable and a concise author; Also 3 or 4 of the other researchers and writers in this program. They all appear authentic. I am preparing to order more of their programs; because they sound great, and i believe I can trust them and work with them. Corn tortillas are high in carbs that raise heart disease- causing tri-glycerides. Not a smart choice. Atkins R Dr 1973. Spinach is high in oxalates that block calcium absorption and form kidney stones. Olive oil is high in 3 plant allergens. phloridzin, chlorogenic avcid and gallic acid that inlame respectively the pituatary, hypothalamus and pancreas. Inlamed body parts degrade, and these parts join up to form the cancer nucleus, essential to start and fuel all malignancies. Clark HR, PhD ND 2007. Cholesterol diet? I think, (know) you have been mislead. I love the “new” grains, like quinoa. I think they are more healthy than the “white” foods I used to eat. I also love mushrooms in almost everything. They are so fat free and low calorie, and taste to delicious. I also like adding tofu to many dishes, instead of potatos or rice. I only use brown rice now; and not as often. Now, I make sure there are green veggies, or healthy white ones, like cauliflour or turnips, or the more exotic ones, jicama, for example, or water chestnuts in my primary dish. They make the old recipes come alive. I also leave out some fats, cut back on carbs. Now I have a more “enriched” lifestyle as far as meals are concerned. I enjoy the new way of cooking and eating. I just love quinoa. It can be cooked with so many different other veggies and condiments, and it is so delicious with the minimum of ingredients. I like it with a citrus taste, and some green veggies added in with it. I think it is beautiful with its tiny little circles all in it! I buy it in a nearby town by the pound, in several large bags. I love Blue Heron Health News, too, and all of the writer/researchers have such interesting lives and interesting jobs.